Macroscopic quantum phase coherence has one of its pivotal expressions in the Josephson effect, which manifests itself both in charge and energy transport. The ability to master the amount of heat transferred through two tunnel-coupled superconductors by tuning their phase difference is the core of coherent caloritronics, and is expected to be a key tool in a number of nanoscience fields, including solid-state cooling, thermal isolation, radiation detection, quantum information and thermal logic. In this work, Francesco Giazotto and co-workers, from Istituto Nanoscienze and Scuola Normale Superiore at NEST Laboratory show the realization of the first balanced Josephson heat modulator designed to offer full control at the nanoscale over the phase-coherent component of thermal currents. Their device provides magnetic-flux-dependent temperature modulations up to 40 mK in amplitude with a maximum of the flux-to-temperature transfer coefficient reaching 200 mK per flux quantum at a bath temperature of 25 mK. 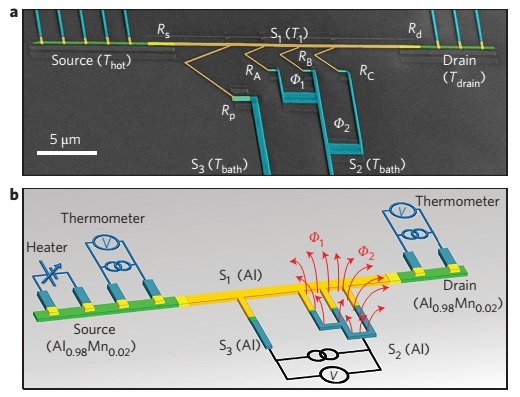 Foremost, they demonstrated the exact correspondence in the phase engineering of charge and heat currents, breaking ground for advanced caloritronic nanodevices such as thermal splitters, heat pumps and time-dependent electronic engines.